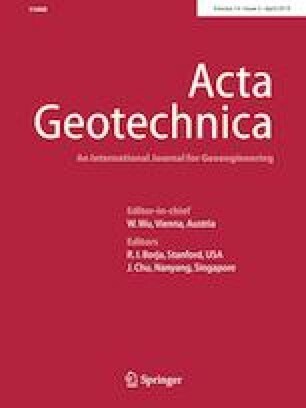 Many civil engineering projects are related to hydromechanical behavior of unsaturated soils over a wide suction range, which was investigated by imposing suctions on clayey silt specimens using the axis translation technique and the vapor equilibrium technique with saturated salt solution in this paper. Firstly, the effect of void ratio or density on the water retention behavior was discussed based on the measured data. The test data indicate that shear tests under constant water content can be considered as those under constant suction in high suction range. Secondly, the mercury intrusion porosimetry tests were also performed to observe the pore-size distribution of compacted specimens with different void ratios. The experimental results show that the inter-aggregate pores of compacted specimens decrease with increasing the initial void ratio, but the intra-aggregate pores remain unaffected, which can explain the water retention behavior of compacted specimens with different initial void ratios over a wide suction range. Finally, for triaxial shear tests, the shear strength increases with increasing the suction until a maximum strength is reached at a specific suction value. When the suction is higher than the specific suction value, the tendency of strength change depends on the density in high suction range. The authors express their gratitude for the grants provided by the National Natural Science Foundation of China (Nos. 11672172 and 41630633) and Taizhou Science and Technology Planning Project (No. 1702gy09), and the first author was sponsored by the China Scholarship Council (No. 201706890064) during this study.